One of the things I’ve been working on for the Dream-Quest of Unknown Kadath graphic novel is a map of the Dreamlands, as described in Dream-Quest and other Lovecraft stories. The results which will appear in the book are here, or here if you want a closer to full-size version. Just to reassure everybody, this map *isn’t* the same as the poster map which will be included for “Journeyman Dreamer” and up level backers — that map will be a 24″x36″ color map which will more or less look like a color version of this but will also include some other stuff off the edges of the map, including some locations I couldn’t squeeze into this version. But for this book version I tried to include all the important stuff from “The Doom That Came to Sarnath”, “The Quest of Iranon”, “Dream-Quest”, “The Other Gods”, “The Cats of Ulthar,” “Celephais” and some of his shorter stories and poetry. I’ve also included some areas described by other authors who inspired or were inspired by Lovecraft — the incredible Lord Dunsany and the great Gary Myers — or in some cases, authors I had to include just because. 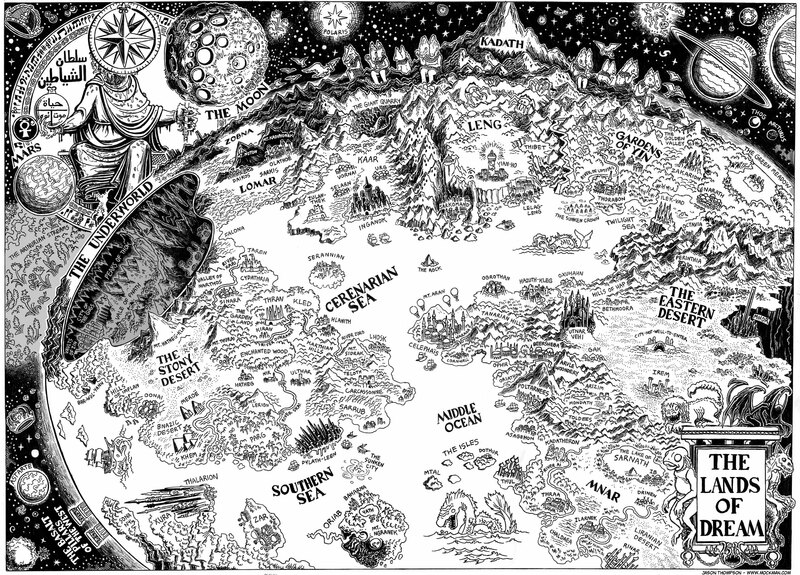 The most famous map of the Dreamlands is probably the one included in Chaosium’s “Dreamlands” supplement for Call of Cthulhu, of which the most recent version was drawn by Andy Hopp, but I didn’t look at that one so as to try not to copy it. If this map still has similarities to that one, hopefully it’s from following the same text, although I’ll never be able to forget all my years playing Call of Cthulhu. It’s interesting how the continents of the Dreamlands mimic that “T-O” shape used in Medieval European maps, which usually depicted the world as a circle with a T-shape drawn in it, with the world divided into three parts: Africa, Europe and Asia. Here, that would be the North, the West and the East, all of which have their own character, from the jungles of Parg to the vast and dusty deserts of the east, from the Basalt Pillars of the West the fearsome icy heights of the North. I’m looking forward to coloring it and expanding the map out to the southern edge of the Earth and beyond. This is fun! Hope you like it! Love seeing the Dunsanian locales in there, too! Thanks! I’m including more of them in the big version!